I just finished setting up my integrated hardware and software system for performing and for recording the performance on up to 32 tracks. I tested and tried everything thoroughly, and feel confident that I can easily do an afternoon of live sound design. I recorded a little solo improvisation and Midwinter meditation, using everything I perform with which does not need a microphone: My “Cork City Gamelan” percussion samples and drones made from them in the introduction, and mainly my new modular Synthesizer together with some granular synthesis throughout the rest of the piece. The source for the granulation is one of the stretched sample drones. Entrainment And Resolution is a self-imposed directive for improvisation and it is part of my live repertoire. This take is a little under 12 minutes long. There are three short movements with no breaks: Introduction, Entrainment and Resolution. I published it on my Soundcloud page. Enjoy, and have a Cool Yule! The Hub of my Performance set-up is an AudioMulch patch on my computer. It is an alternative to using a DAW for working in a more free form way, more suitable for improvisation. 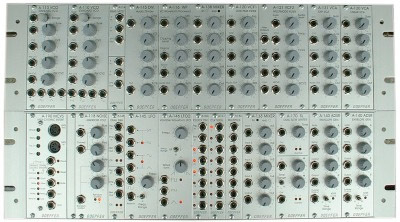 The BPM clock in AudioMulch becomes the system-wide MIDI clock. Like in a DAW, effects can synchronize to the BPM clock. 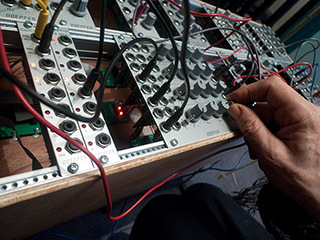 A Max/MSP patch reads the MIDI clock and sends beats and algorithmically composed musical gestures to a synthesizer module which converts them to voltages for feeding into a patch on my synthesizer. For performance, I interact with the synthesizer directly. I play the samples and granular synthesis effects in AudioMulch via small MIDI controllers. I use delay and quantize effects in AudioMulch… and because the BPM clock is also the MIDI clock… to which the synth beats are synchronized… increasing the speed of the effects in AudioMulch speeds up the synthesizer beats in perfect synchronization. For making live noises along with it all, I have two microphones attached to my Audio Interface. I am trying to make a habit of always recording EVERYTHING I play in AudioMulch. Today, the 21st of June, is World Music Day. Most often it falls on Midsummer Day, but Summer Solstice came early this year: less than an hour before midnight… and that is enough to make it so that yesterday was Midsummer Day. 1985 was special for me. It had been designated European Year Of Music, and I was privileged to represent Cork City with an event. I have made a point of doing little musical meditations every year for both Solstices since then. This year I composed some music using only my Cork City sounds and those brass chimes which seem to insert themselves into almost everything I do. Sunrise In The Glade – about 4 1/2 minutes long, 4.3 MB in the iTunes / iPod AAC / .m4a format, opens in a new window. I re-used the drone build-up from Fluid Mechanics and added two more layers. It now has 12 layers of solid sound by the time it reaches the climax. Enjoy, and feel free to remix it, cut it up, mangle it, as long as you do it within the rules laid out in the Disclaimer page. 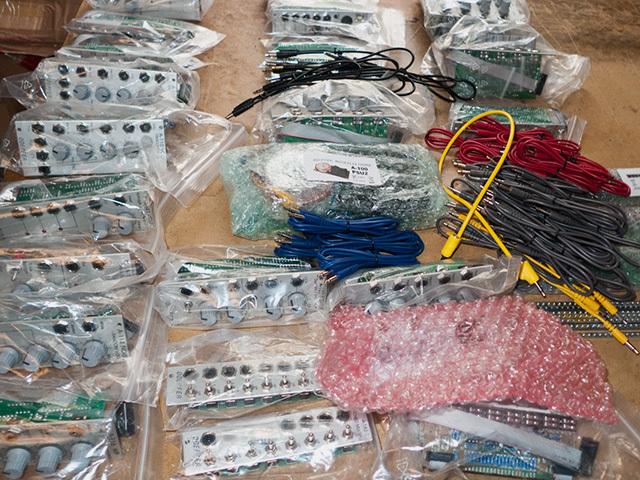 Patchers are software for making music. When working with a patcher, the music maker starts by actually designing and building software instruments to realize a specific idea, a set of ideas, a sound effect… or a complete epic composition or a movie soundtrack. This is the exceptionally simple patch for my Cork City Gamelan live performance instrument under development. Each of the nodes has its own set of on-screen controls, which can be operated via MIDI controllers. It will probably be under development forever, and grow to become a lot more complex. I am slow at the moment, having to get used to “what is where” – so, right now, my live improvisations are slowly evolving lengthy pieces – but hey, that’s very much my favourite mood of music for listening to… and very emphatically calling myself an “enthusiastic amateur” music composer means: first and foremost, the music I make must please myself. 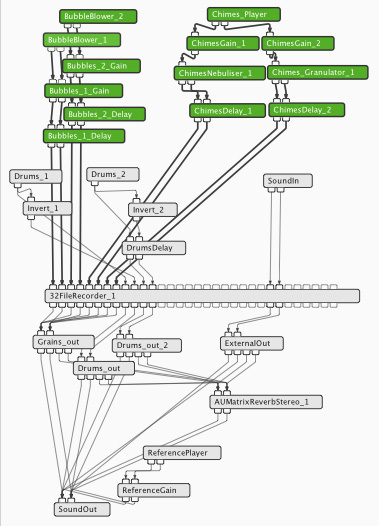 Some patchers are free open source programs: cSound, PD (for Pure Data), and Supercollider. They are used a lot by researchers and students at colleges. 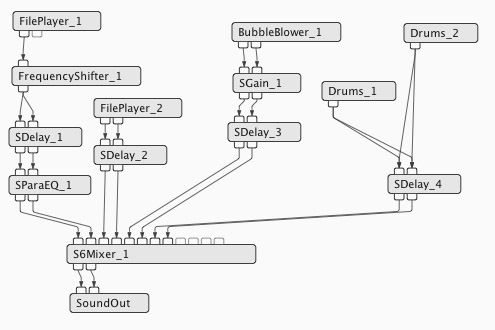 There is also Max/MSP, a top-of-the-range commercial application (at a top-of-the-range cost), which is widely used by experimental New Music composers and recording artists, and which comes with extensions for working with video. 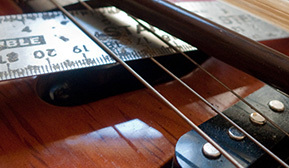 They allow complete control over interface design, and, important for many artists, they can be used to exploit any kind of data sets from any field of study or research for using them within music projects – say, to create structures, textures or melodies based on population statistics or weather charts… at a cost: they are very “low level” – which means using them requires some experience at Software Engineering. I decided Audio Mulch would probably suit me best. The interface is almost identical to building shader trees in Computer Graphics – something I am thoroughly familiar with. I cannot design my own interface elements, but I am quite happy with the interface supplied by the programmer… and the ability to handle external non-music data is irrelevant to me. This program suits me down to the ground. Unlike most of them, it isn’t free to use, but it costs a lot less than Max/MSP… and most importantly: the piece of music I am posting here… I made that after only three days of exploring the software! There is absolutely no way I could have achieved anything like it with any other patcher. Thank you, Ross Bencina: I haven’t paid you for it yet, but I certainly will. Your software is instrumental for me, to get back into performing life after my long hiatus.